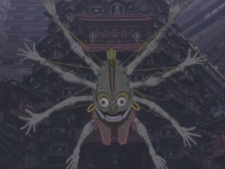 This is the fourth demon seen and was the one to capture Yaimao at the end of the movie. This demon steals away children; it jumps with its strong eight arms and crashes down on the child, then it wraps the child up in thread and carries them away. During the making of the movie, this demon had many different types of masks, but it was chosen to wear the biggest of the mask drawings.